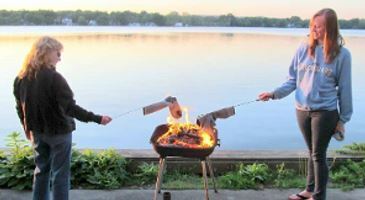 The Sailing Club is designed to promote sailing on Lake Parsippany by creating a camaraderie of sailors of all ages and ability levels, both male and female. All Lake Parsippany members (age 11 and up) are welcome to join the sailing club and are required to take the sailing class. You MUST sign up for the sailing class on or before Open House. After completing the class you may have use of Club sailboats for your sailing pleasure. 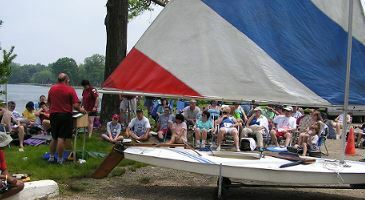 The Lake Parsippany Sailing Club is not a racing club, but it certainly seems to be a popular one, with some 60 to 80 members of the private lake joining the Club. The Sailing Class teaches new and returning students the basics of sailing. The course runs approximately 5 hours on a Saturday early in June. About 90 minutes are spent indoors, with the rest of the time being spent on a sailboat (with an instructor for those first-timers). Students learn enough so they can go anywhere on the lake they wishand return back to their starting point (hopefully without capsizing). The Club also sponsors sailing events throughout the season. There are 4 or 5 sailing events scheduled in July, August and September which progressively introduce more skills to help increase each sailor's needs and abilities. Come to our meeting and learn more about our purpose and meet some of our members. If ropes or tying knots capture your imagination, stop in for the Knot of the Month demo. Each month a video is presented on sailing or boating. Signs, shown below, hang at Sailing Center the week before each event.